This quilt block called Star and Octagon was designed in the 1930s -- or at least as far as my research would indicate. 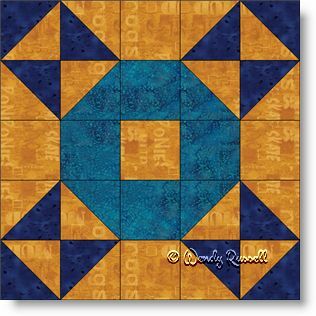 It is a simple to sew five patch block featuring the two most basic quilt patches -- the square and the half square triangle. If you are a regular visitor to this website, you will notice that I tend to construct five patch blocks as an uneven nine patch rather than as five rows of five patches. This is simply a personal choice as I find it is easier to sew, but please feel free to use whatever method you prefer. I enjoyed designing quilts for this block -- mostly because one often thinks that simple blocks can be boring. As you can see from the sample quilts illustrated, you can make some very attractive quilts just by adding some optional sashing strips and/or extra blank blocks to showcase your quilting skills. The designs you can come up with are endless, so let's get started!